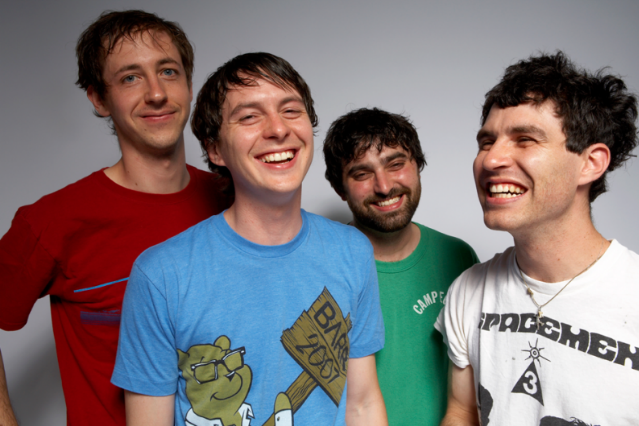 Animal Collective have a habit of oscillating between sweetly melodic accessibility and pull-up-the-drawbridges experimentation. One moment the Baltimore-born art-pop outfit might put out a widely hailed touchstone like Merriweather Post Pavilion, the next a droning droning Record Store Day 12″ likely to drive away casual fans. Both aspects of Animal Collective can be found on the two sides of the band’s upcoming 7″ single, due out June 26 on Domino but streaming now, with production by the group and previous studio collaborator Ben Allen (Gnarls Barkley, Deerhunter). A-side “Honeycomb” has cartoon-like sound effects, bouncy electronic blips and bloops, and yawping vocals that appear to be conveying optimistic lyrics — something about the “impossible places” you can go in “your life” (shouts to Dr. Seuss?). B-side “Gotham,” accompanied by black-and-white artwork, is more guitar-driven but also harder to grab hold of, a slow-paced psych-pop ballad washed out by distortion. We kid about Animal Collective’s studio process, but this first non-RSD single from the group in a hot minute offers few clues toward the direction of the long-awaited follow-up to Merriweather Post Pavilion. What would they want? Still sky, by the sound of it. As in, the possibilities are pretty much wide open.